The price is for a pair of RCA cables. 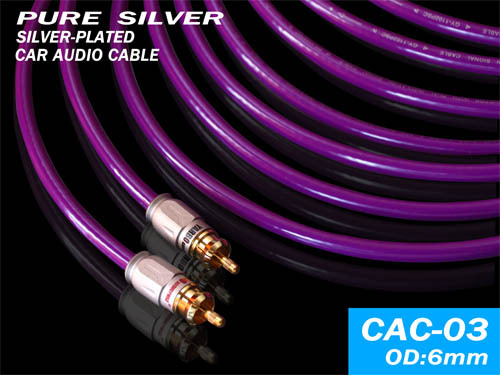 CAC-03 is a pair of RCA cables. 1. Wire composition: select "99.9999% pure silver wire in Germany"
The composite round shape, the two core conductors are respectively covered with Teflon medium. Internal structure Two-core wire is built in the center of the wire after large pitch twisting. The gap is filled (white cotton thread) tightly wrapped with (SHIELDED), and then (0.10mm high quality silver plated wire) is used to weave the tight shielding layer. It is purple PVC. 2. It is equipped with the imported precision, superconducting, 24K gold plated RCA, and the unique stylus terminal with signal enhanced embossed floating point, which is more closely contacted for conduction, reducing the loss in signal transmission, and its signal transmission characteristics. Better. 3. All solder joints are soldered with German WBT silver tin professional, filled with transparent imported adhesive inside, which can effectively prevent conductor oxidation, thus ensuring stable long-term use of audio transmission. Quality assurance. L: lm-50m, special length can be reserved, customers can purchase imported powerful filter magnetic ring assembly.